I don’t know if you know this about me, but I love trackers. Well, trackers and logs – I don’t discriminate. Either way, I’m a sucker for collecting data so I can learn more about my patterns and habits. That knowledge is key to changing your life because you can’t know what to change or how to make the change if you’re working from incomplete data. That’s why I decided to create a Year in Pixels chart so I can have a bird’s eye view of my moods and emotions! 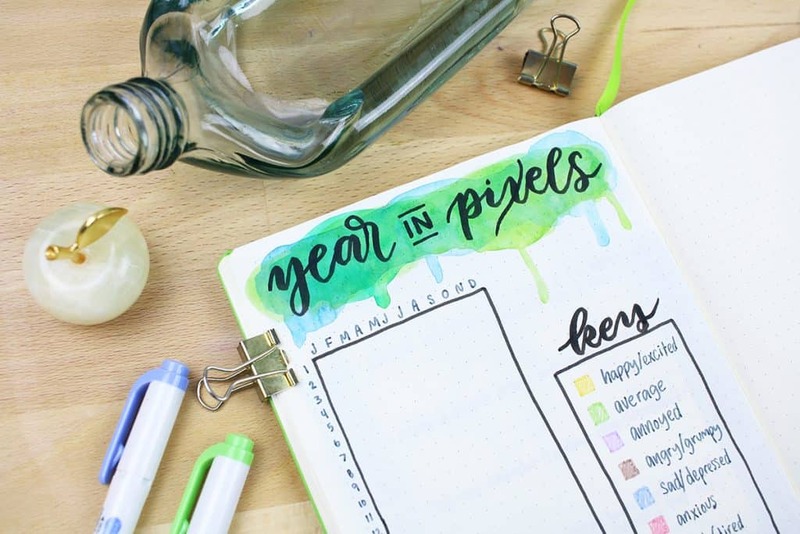 The Year in Pixels chart was created by Camille or @passioncarnets on Instagram. While the scale of this mood tracker is large, the concept is deceptively simple. To set it up, you need twelve columns for each month of the year along with 31 rows for the days. That means that there are exactly 365 squares, or pixels, for you to track your mood! Once you have your chart created, you need to create a key. 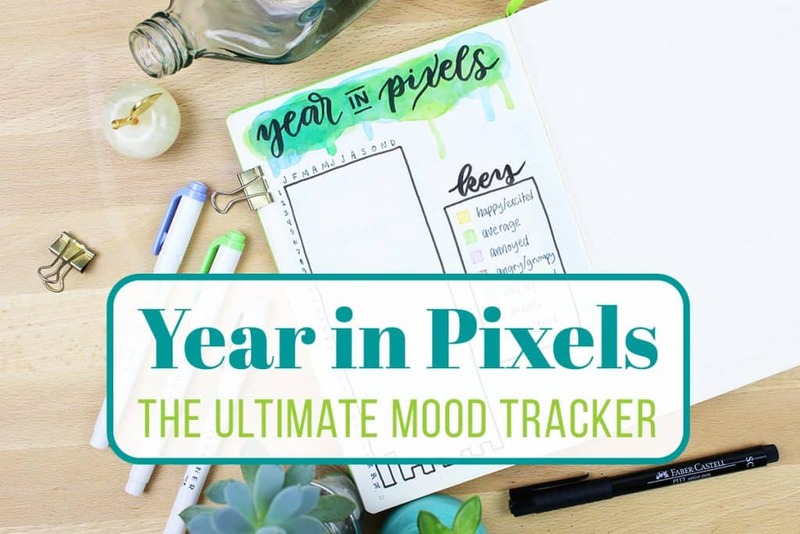 Your A Year in Pixels can track as many or as few moods as you like – I kept mine pretty sparse with only seven moods. I decided to commit to using my Zebra Mildliners in my A Year in Pixels chart for the whole year, but you can use whatever pen you want. Just make sure you can easily tell the colors apart! Remember, you want to be able to see patterns at a glance, so similar colors may end up being confusing. 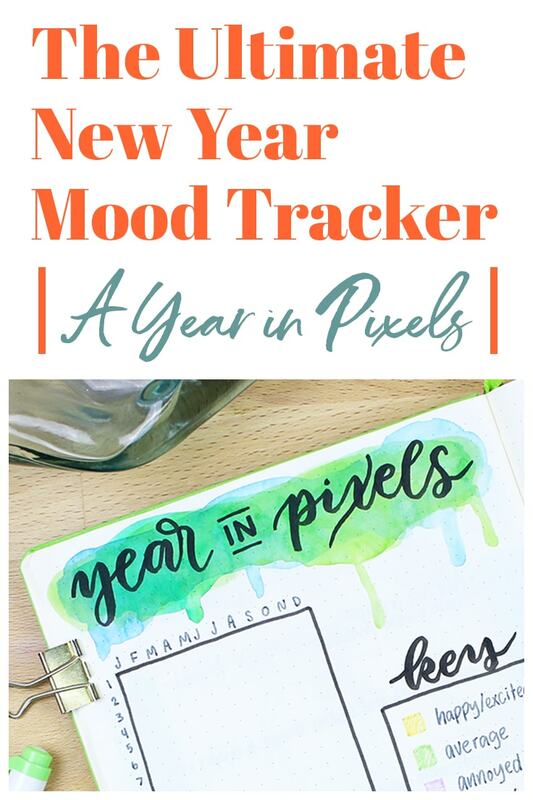 You might be wondering why you would want to keep a mood tracker like A Year in Pixels. Well, there are a few reasons that you might benefit. For people with anxiety, depression, or other mental health issues, it can be an excellent way to track symptoms and episodes over a long period of time – either for themselves or to share with their doctors. I know I have been struggling with my mental health as of late, so focusing a bit more on my daily emotions is one way to take care of myself. You can be caught up in a bad mood or bad mental health day and think that your whole life is bad. But if you keep a Year in Pixels page, you can look at your patterns and see that maybe it isn’t as bad as it seems. Keeping a mood tracker is also a great way to see if your moods come on a certain cycle *ahem – ladies know what I mean* making this spread a great pairing with a period log. Knowing when your mood patterns come and go means you can plan and prepare ahead of time. If you know you get stressed out during a certain day of the week, time of the month, or time of the year, you can take extra care of yourself during those down times. Or you can plan a day trip to lift your spirits, get away, or grab some precious alone time. I have been struggling with my mental health lately, along with my work-life balance. I know these two are connected, and I am working on both in the coming months. But I know that keeping this A Year in Pixels chart is going to help me find the balance I need to live a healthy life. Knowledge is power, and this is the ultimate mood tracker to give me insight into the wild animal that is my mood. Every bit of information gathered is one step toward achieving my goal of a healthy mind and happy spirit. Don’t worry if you wanna take a break. Just find you blog post today ! Thank you so much for the feature ! I love how your Year In Pixels looks, hope you’ll have a wonderful year ! Thank you Camille! Same to you. I think its fantastic that you shared this idea, and that you are working on your mental health. I had a bad accident in December (broke both wrists) and using your bullet journal ideas has been helping me with getting range of motion back in my hands. Sitting and carefully drawing out planning pages is also comforting! I have also been aware of my mood (since it would be utterly normal to have depression/grief with this injury), and I think this tracker will help me with seeing that pattern. So thank you for sharing it (and everything else!). I thought you might also be interested in this: https://cambridge-intelligence.com/keylines/ – how companies use visualization to track data patterns (and spot hackers!) – just a fun aside for you. So glad this is something that will be helpful for you Maggie! Hope your recovery is as quick as possible. 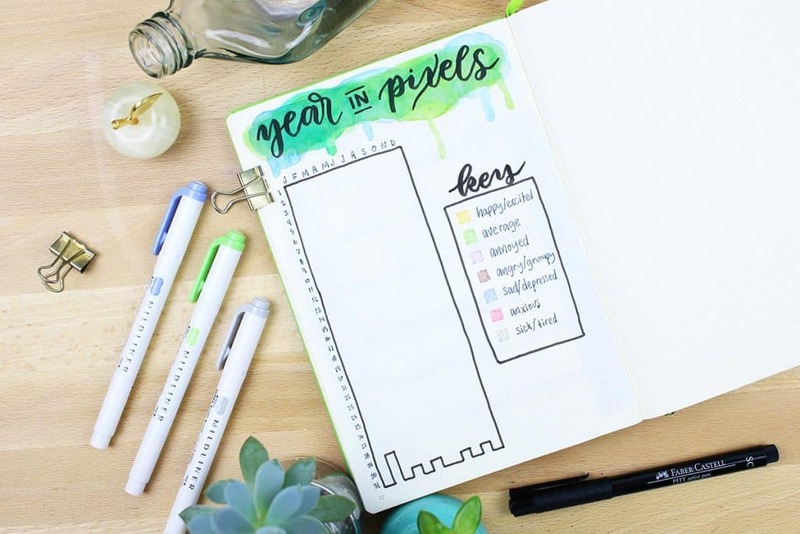 Hi there, I love this idea and I did create a tracker , but I also found myself struggling with selecting a mood for the day. What I decided to do was come up with an overall rating. I started trying to look at 1 thru 10, but got overwhelmed with too many choices and went with 1 through 5. 1 – feeling very low, 2- being in-between low and average, 3 -feeling average , 4 between average and blissful, and 5 – it was a blissful day. I’ll probably end up shading in the numbers and color-coding them just because it will be easy to review. Thanks for the inspiration to create this. Love your blog ! That sounds like a great way to track your moods as well Lori. Thanks for reading! He Shelby – I like this overall year thing, all in one place so it’s easier to keep referencing the same place- establish a habit. I’m having a hard time with the “overall” mood for the day tho. That’s tough. When do you fill your’s out- the next morning or the evening of that day? Do you set an appointment with yourself to do this and maybe review for the next day? Possibly overthinking here… How do you decide on your mood for the day? Do you go with overall mood, do you do several colors in a day? Good question, Jen! Usually when I sit down to fill it out, I try to think of the overall mood of the day. I try to not let my mood in the moment get in the way of the overall theme – though it can be tough to be objective sometimes! It’s just a gut feeling when you come down to it. I’m colorblind, so I don’t think using colors to distinguish between the various moods being tracked will work well for me. 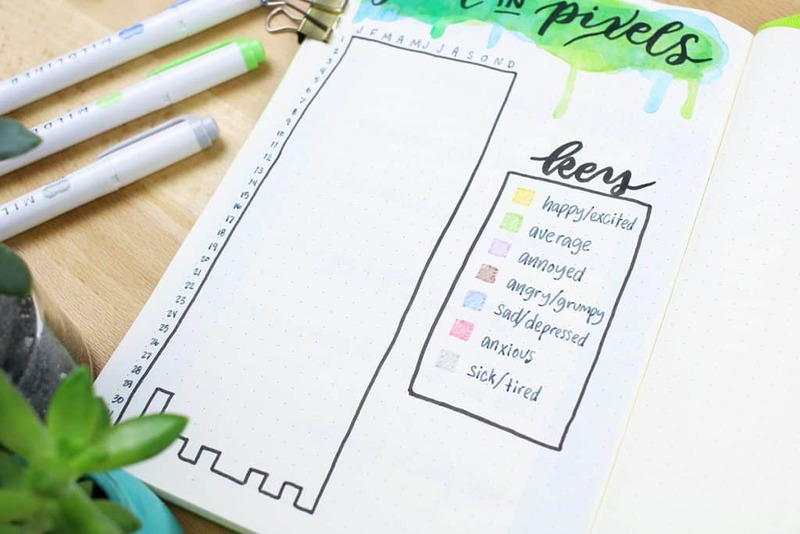 Any ideas about ways to adapt this tracker so that each mood is visually clear but not relying on color to get the job done? Ooooh, that’s a good one, Tom! I think shapes would be your best bet. Square for happy, triangle for annoyed, star for productive… you get the idea. If you run out of easy shapes, you can have an empty triangle for one mood and a filled in triangle for another. I hope that helps! Love this and printed out something similar yet less pretty last night. My worry is that I will be too lazy to be grabbing the colored pens when I’m moody, so My plan is to also add some sort of B/W patterns for the mood legend as well. Tracking so many things is vital for my mental health and I’d been doing a sort of half-assed job via my FitBit, but that isn’t enough, especially when I see the doc and can’t remember why I didn’t move much at all on the 15th of the last month, for example. Thanks so much for designing a pretty one that I will be more likely to get excited about and keep up with! The beauty of this is you can adapt it to whatever works best for you Gwen! A black/ white option would be great or even different shapes would work, then you don’t have to worry about getting your colored pencils out each day. I love the drippy watercolor effect that you are using on all these layouts. Can you do a tutorial showing us how it is done? You can extend the water down on the page as I did in that post to create the drips! I will add this to my list of suggested tutorials as well ? That is such a fantastic idea and really creative. It is something quite out of the ordinary. I really love it so much. Thanks. Glad to hear you love it Sarah! Thank you! I was trying to find the original creator on Pinterest and having no luck! I’ve added a link to her Instagram and the post.